We’d love your help. 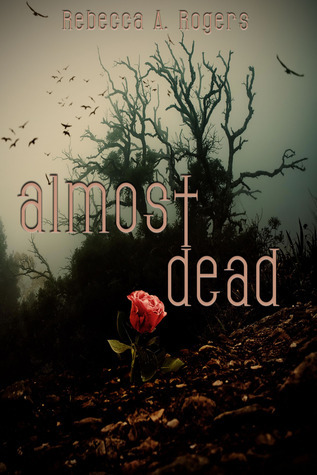 Let us know what’s wrong with this preview of Almost Dead by Rebecca A. Rogers. After recovering from the initial shock of seeing thei Seventeen-year-old Flora Mackey is not exactly thrilled to wake up from a car accident and find out she’s a ghost. Making this lifelike hell even worse is being trapped with her arch enemy and collision partner, Laney Tipps. The two normally couldn’t get along if their lives depended on it, but now they have no choice. "...but at the end of the day, and on some strange, out-of-this-world level, we formed a connection. A connection which just saved our lives." Two teenage girls who are just about as opposite as can be have crashed their cars on the perilous 'Death's Cliff.' Flora feels overlooked by her parents, who put all their effort into her athletically inclined brother, Derek. Flora's grades in school are dropping she drinks a lot. Flora's best friend Mia is the only other person who understands her, Mia's "...but at the end of the day, and on some strange, out-of-this-world level, we formed a connection. A connection which just saved our lives." Two teenage girls who are just about as opposite as can be have crashed their cars on the perilous 'Death's Cliff.' Flora feels overlooked by her parents, who put all their effort into her athletically inclined brother, Derek. Flora's grades in school are dropping she drinks a lot. Flora's best friend Mia is the only other person who understands her, Mia's parents are away all the time on lavish vacations and seem to care more about her beauty pageant sister, Laney. Flora, who is drunk and Laney, who is too preoccupied with her chapstick crash their cars into one another on Death's Cliff. Their spirits are now stuck somewhere in between, in Lichburn and the Shadowlands. Their bodies are not quite dead, but might be if their spirits cannot get word to their loved ones where their dying bodies are in time. They'll have to work together to find their way back to life. I probably would have connected more with this story if I were still a teenaged girl. Both Flora and Laney's characters are filled with teen angst and drama. I actually really like the plot of the story, which kept me reading; the characters just fell flat for me. Flora and Laney are opposites in life; however, they both read the same in the book. The point of view in the book also switches back and forth between Flora and Laney, but since their voices are so similar, I would sometimes have to go back and look at who's voice I was reading from. The most interesting character in the book was Sara, a spirit guide in Lichburn. She had a very unique voice and intriguing story. I would love to know more about her life and death. The setting of the semi-afterlife, waiting room areas of Lichburn and the Shadowlands was also a curiosity. I know that Flora and Laney's characters didn't know much about it either, but I could have done with some more explanation. I did enjoy the loop at the end, and there are some good lessons in here for younger readers. The basic story is that two bratty girls run off the road and are killed. They are sent to a Purgatory type environment as ghosts. If they can contact their families to find their bodies in time they will return to life. The weakness of this story is that it changes POV every chapter from the two characters of Laney and Flora. Both are in first person and similar forcing you to return to the beginning to see who is speaking. This is reminiscent to Allegiant’s switching POV though it gets easier o The basic story is that two bratty girls run off the road and are killed. They are sent to a Purgatory type environment as ghosts. If they can contact their families to find their bodies in time they will return to life. The weakness of this story is that it changes POV every chapter from the two characters of Laney and Flora. Both are in first person and similar forcing you to return to the beginning to see who is speaking. This is reminiscent to Allegiant’s switching POV though it gets easier over time so you can enjoy the story. I won’t give away the ending. I will say this is interesting and worth a read. I sensed what the outcome would be and was close. There is a twist at the end. I rate it three and half stars and recommend it to all. This was obtained from LibraryThing in exchange for an honest review. I've read better in this genre but I like how it's harsher then you would expect and not everything works out perfectly.